This is Day 5 of the 14-Day Kindness Challenge where you practice kindness for 14 days. This challenge is now over but you can still do the tasks in your own time! Visit the overview page for all Kindness Challenge tasks and posts. Our Kindness Tasks So Far! For example, there’s participant Hendro who went and signed up as a voluntary member at Singapore Art Museum yesterday due to Day 4’s task on signing up for volunteer work. There’s participant Chestnut who gamely signed up to volunteer for one entire month in Africa. There’s participant Qin Tang (check out her blog On My Mind) who wrote five thank-you notes as a result of Day 3’s task to write thank-you notes—and that’s two more notes than the assigned three notes! And many many more. Day 4’s task was to Sign Up For Volunteer Work (On Top of Whatever You Have Been Doing). As I had mentioned in Day 4’s post, I have been thinking of volunteering at the SPCA—Society for the Prevention of Cruelty to Animals. I thought, “Hey, since I’m doing the Kindness Challenge, might as well take this chance to sign up for SPCA!” So, I did! 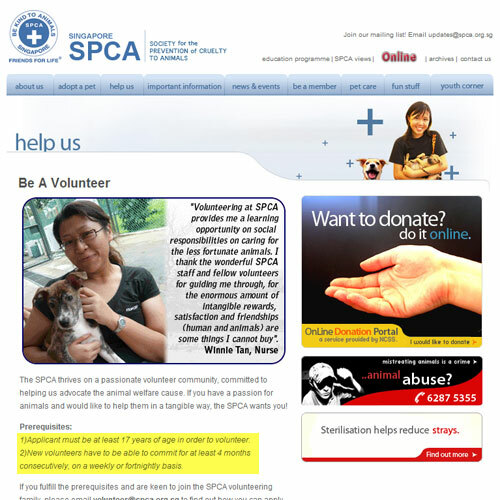 The SPCA (Singapore) website volunteer section. I surfed over to SPCA’s site, then entered the volunteer section. As I looked for the instructions to register as a volunteer, I saw the prerequisites to be a volunteer: (a) must be at least 17 years of age, which I qualify (I’m 28 this year), (b) able to commit for at least 4 months consecutively on a weekly or fortnightly basis. When I saw the second criteria, I thought, “Bum!! !” I was thinking of a lighter engagement as my busy schedule does make it hard for me to invest that much time in anything else. However, no sooner did that thought disappear, for I told myself that I really should be more committed to my desire to volunteer at the shelter. So what if it’s a commitment of at least four months? I’ll just make it work out then. It’s all in the name of a good cause. Update Nov 5 (Day 5): Jaclyn the volunteer coordinator at SPCA has reverted! She sent me the member form which I need to fill in, after which I would be booked into a member orientation session (about 1.5 hours) which will determine if I will get selected for the volunteer work program. They even said that they have “overwhelming” applications and may take some time to revert. Uh, okay. o_O Nice to know that there are many people who offer to volunteer at the shelter. I’ll be filling up and submitting the member form this week, and anticipate attending the next orientation session (they hold them once every month). Will update my progress in time on the blog. Do you give compliments to others? 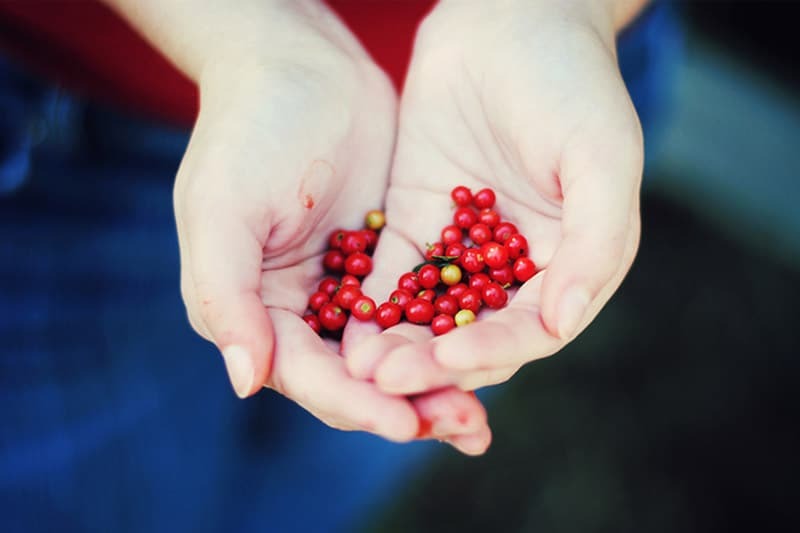 In the article Are You Emotionally Generous?, I talked about the importance of being emotionally generous to others. Giving compliments, genuine compliments, is precisely an act of emotional generosity to others. Some people might confuse giving compliments with giving thank yous, which was the task for Day 3. 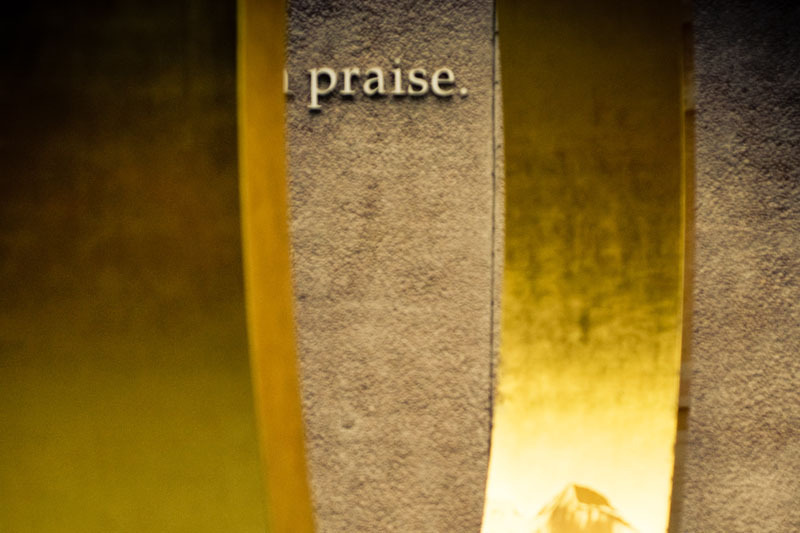 To differentiate between the two, compliment means recognizing something positive about a person and giving praise for it, while the thank-you is about expressing appreciation and gratitude, for something the person did to you or for you before. An example of a compliment would be telling the person that he/she looks great today (if that is indeed what you feel), while an example of a thank-you would be thanking the person for being there for you when you were down a week ago. Your task today is to give people a genuine compliment! Pick one person, any person, to give a genuine compliment to. Give a genuine compliment to at least three people. Think you can do that? I think you can! 🙂 In fact, the more people, the better!! After you are done with Day 5, proceed to Day 6: Talk to Someone You Don’t Normally Talk To. 21DFC Day 7 – Celebrating 1 Week of Fitness!